Types of Art: The Igbira are skilled weavers. History: Igbira history is tied to that of their neighbors, the Jukun and the Igala. 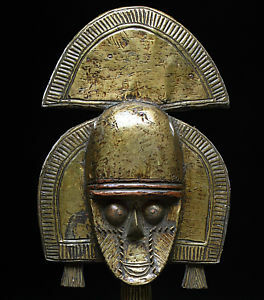 Oral history claims that these people originally came from the east and entered Nigeria betwen the Mandarra highlands and Lake Chad sometime during the last thousand years. It is believed that Igala broke away from Jukun, and the Igbira broke away from the Igala. According to oral tradition, Ohimnagedu eststablished the first Igbira chiefdom at Panda and was given the royal staff by the Ata of Idah, the Igala leader at the time. Ritual connections, however, were still maintained with Jukun. Igbira consists of two smaller groups. The first, the northern Igbira, is the one described above. The second, the southern Igbira, claims to have broken away from the main group around 1850 during the time of the Fulani-led holy wars. Economy: Igbira are mainly farmers. The primary crops grown for export are yam and cassava. Guinea corn is an important local commodity as the staple of most meals and is used in the brewing of beer. Other crops include rice, millet, cow peas, and groundnuts. Goats, sheep, cows, and pigs are also raised for local consumption. Rivers and streams abound on the Niger-Benue plateau. Fishing is conducted by individual households, and in recent years larger fish farms have been developed by private and public firms. Political Systems: The northern Igbira traditionally had a highly centralized government that recognized a chief who inherited his power in a patrilineal fashion. The supreme Igbira chief was divine and resided at Panda. Numerous local chiefs who were the heads of royal families reported to him, producing what was in effect a miniture confederacy. The head chief received tributes from local chiefs, and in return he sent gifts. The Igbira state system was similar to that of the Igala. The southern Igbira group was somewhat less centralized than their northern cousins. Their governing system acknowledges local leaders for each of the five founding families, but does not recognize a supreme chief. Religion: Igbira pay homage and respect to the dead, which consists of both those who have died and those who have yet to be born. As was stated above, many of the ritual practices associated with the Igbira are directly related to those of the Jukun, their distant ancestors. Although political power often rests in the hands of the patriclan, religious power usually is in the hands of the matriclan. This arrangement allows for a balance of power between kin and also allows kinship relationships to be extended. Religious rituals are held in an effort to achieve balance between the dead, the god, bush spirits, and the living.